Lions, Cheetahs, and Dogs, Oh My! Part 1. By now it’s no secret that lions are kind of mean – and that if you are any other carnivore living in the Serengeti, you’d probably prefer a lion-less world. No tawny, muscle-bound foes to steal your food, kill your cubs, chase you around…life would be easy! You’d have plenty of food, your cubs would grow up strong, and your numbers would increase. It certainly makes sense that all the nasty things that lions do to other carnivores should add up to limit their numbers. Lions are responsible for nearly 30% of wild dog deaths, and over 50% of cheetah deaths! On top of that, they steal food that cheetahs and wild dogs have worked hard to get – and might not have the energy to get again. Researchers are pretty sure that more lions means fewer wild dogs in two ways: 1) In reserves where there are more lions, there are fewer wild dogs, and 2) When lion numbers increase through time, wild dog populations decline. The same has generally been believed about cheetahs, and some research from the 1990s suggested that reserves with more lions had fewer cheetahs. But as I started digging into the data from Serengeti, I saw a different, quite unexpected, story. 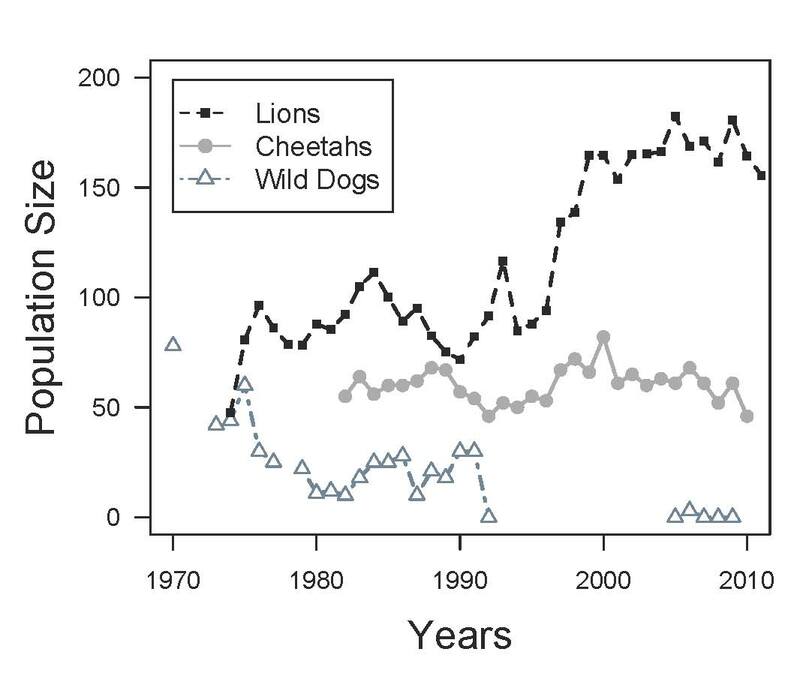 The number of lions, cheetahs, and wild dogs from 1970 onwards. Wild dogs disappeared from the ecosystem from 1992 through 2005. Lions, cheetahs, and wild dogs were all monitored by long-term projects for a number of years. This graph shows their population sizes since the 1960s. The increase in lions is pretty clear – lions have nearly tripled in the last 40 years, largely due to increases in wildebeest. Wild dogs disappeared from the study area. Now, their final disappearance was due in large part to disease, but it’s possible that lions didn’t help matters. In sharp contrast, the cheetah population has stayed pretty much the same. Sure, there are some ups and downs, but on average, the population has been holding steady over the last 40 years. Wait a minute, if lions are really bad for cheetahs, then why haven’t cheetah populations declined in the Serengeti? How can they possibly be holding steady when lion numbers have tripled? What is going on??? It’s a good question. Tune in next week for an answer! A quick clarification for anyone who looked at the graph and exclaimed “There are only 60 cheetahs in Serengeti??! !” The numbers presented here reflect the numbers of cheetahs, lions, and wild dogs *in a shared study area* which is about 1/10th the size of Serengeti. So, I’ve only presented lion numbers for prides that overlap with the cheetah and wild dog studies. The cheetah numbers were collected by the Serengeti Cheetah Project, and reflect all of the cheetahs they have identified within their study area. now every time a comment is added I recieve four emails with the same comment. If not, I’ll try to find more information on how to disable notifications… sorry for the inbox-filling!